This T-SQL tutorial shares SQL codes to create monthly calendar using SQL Server datetime functions like emonth, datepart,dateadd, datename, recursive CTE queries, etc. SQL programmers and database administrators can create calendars executing the final SQL code and SQL Server stored procedure, as well as follow the SQL calendar code step by step explained to understand how SQL Server date functions, SQL CTE queries are used for SQL training. In this SQL tutorial, I want to share T-SQL codes I used to develop an application which will enable programmers to build monthly calendars similar to seen in below screenshot. What is important about this calendar, or for all calendars in our T-SQL tutorial is that Monday is always on the far-left column and Sunday is on the right-most column. Let's start coding in SQL using Transact-SQL features and enhancements. The starting point is a date parameter which will enable SQL programmers to get the full-month. This can be the first date of the month, or the month number and year, too. I'll be using GETDATE() SQL function as an example. So my reference will be today's date value. As SQL developers can realize easily, I read today's date value using SQL Server GetDate() datetime function and add or substract n months to or from today to prepare the new month's calendar. As second step, I'll get the last day of the month, or the end of month date value using SQL EOMONTH() End Of Month function. The second block of our sample SQL calendar code will be for defining the boundaries of dates seen on the monthly calendar. This means, SQL programmers will be able to set the last Monday which belongs to the previous month or if the first of the month is Monday, then we will use it as the beginning date of the calendar. Using similar methods, but this time applying the same solution for finding the last Sunday. If the end of the month date is a Sunday, it is the date we are querying for. Otherwise, we will be selecting all dates from the next month until we reach the first Sunday. Let's check below sample calendar for April, 2015. We have already defined the dates between 1st of April and 30th of April. Unfortunately, as seen in below calendar page, using SQL we have to be able to identify the dates from 30th to 31st of March and from 1st to 3rd of May additionally. I marked around those days within red rectangles. When programmers execute above SQL CTE (Common Table Expression) query, the output will be as follows for April. SQL developers can now execute a SQL recursive query using CTE for fetching all dates between previousmonday and lastsunday date values. Instead of selecting all data from CTE1 resultset in previous code, append following CTE expression and final select. The output of the above SQL statement formed of multiple CTE's will be as follows. 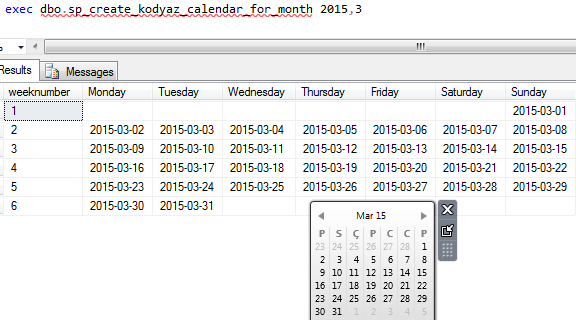 As developers will realize at first look, I create a new SQL stored procedure named sp_create_kodyaz_calendar_for_month. This new stored procedure takes two parameters; year and month as number. Instead of using GetDate() and create calendar tables for months referencing to today, I create the @date parameter on the fly dynamically by using the new @year and @month input parameters. I also used SQL CONCAT() function (string concatenation function in Transact-SQL) in this sample. 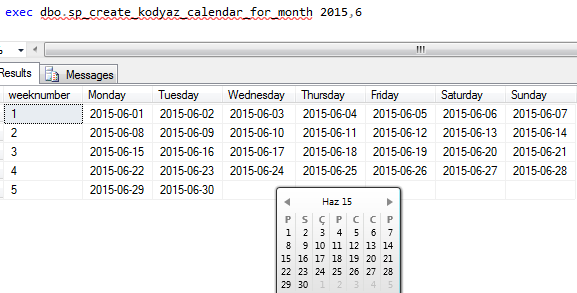 Here is how I executed the new SQL calendar stored procedure and compare it with Windows 7 calendar gadget. SQL programmers can download and use SQL Calendar Script. 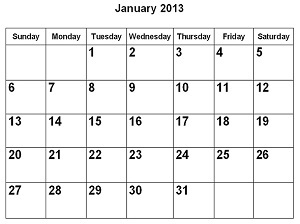 I hope calendar table creation script in this SQL tutorial will be useful for SQL programmers and SQL Server database administrators. Developers and admins can use the script to create calendar tables or at least they can use this as a sample for understanding SQL Server date functions like DateName() SQL function, EMonth(), DateAdd(), and DatePart(), also SQL CTE recursive query structure, multiple CTE's, etc.